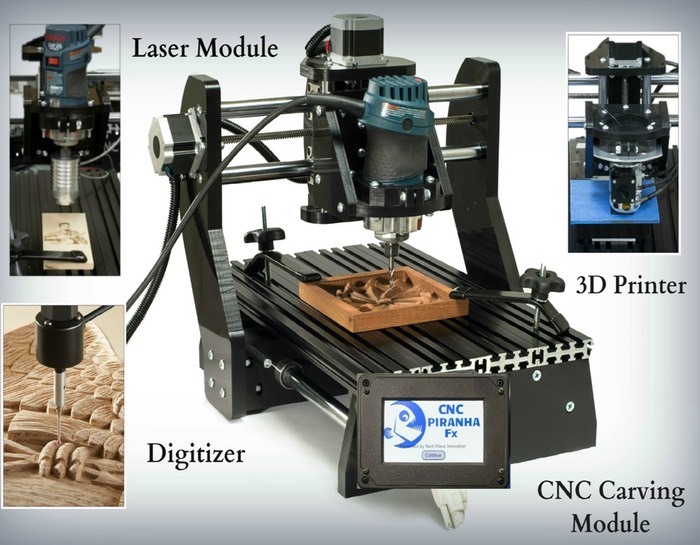 Makers, developers and hobbyists that are looking for all-in-one system that is capable of being a 3D printer, digitizer, CNC carver and laser cutter may be interested in a new system created by designer Tim Owens called the CNC Piranha Fx. In the past Geeky Gadgets have featured a number of different desktop machines that combine a variety of processes in one and in a similar vein the Piranha Fx has been created as a “Make Anything” machine. Watch the video below to learn more about the CNC Piranha Fx. The all-in-one system is currently over on the Kickstarter crowd funding website looking to raise enough pledges to make the jump from concept to production. “Piranha Fx is the latest in a long line of maker and woodworking machinery from a small, but super-innovative company, called Next Wave Automation. Shown below is Piranha Fx with the included Laser Engraver Module. So if you think Piranha Fx all-in-one system is something you could benefit from, visit the Kickstarter website now to make a pledge from $1,999 and help all-in-One System become a reality.